News has been circling since last September that Warner Brothers and Tim Burton had given screenwriter Seth Grahame-Smith the okay to tinker around with some ideas for a potential "Bettlejuice" sequel. It now seems that Seth Grahame-Smith is moving forward with Burton's blessing because he's told Ryan Turek of Shock Till You Drop that he's met with Michael Keaton to talk how to approach a sequel to the beloved 80's film. While Keaton's name conjures up some good feelings about the original, a sequel is a bad idea. Last month I wrote a piece questioning Burton's abilities to give us something original again and this recent news is just another card to stack in the deck showing Burton has nothing new left in him. All he wants to do is continue drumming around with stuff he's already touched or putting his spin on something he's always loved. He's become a studios dream, a cog in the machine. Name recognition is everything with studios these days and Grahame-Smith assured Ryan Turek that Warner Brothers wants to make "Bettlejuice 2" a priority. Of course they do, anything that people can wax nostalgically about is good for the studios. 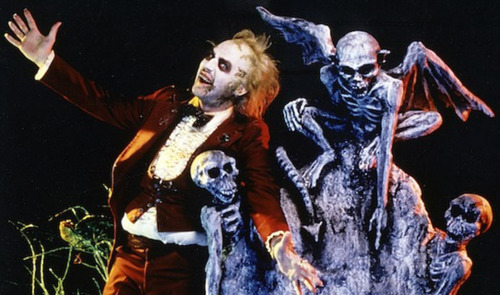 I'm sure a majority of Beetlejuice fans are salivating at the prospect of another story following the deviant bio-exorcist named Betelgeuse but we'd be better off just reminiscing about the good old days because chances of a good to even decent sequel are slim to none. The one shred of credit I give to this potential sequel is Michael Keaton's commitment. Keaton is always a joy to watch on screen and you know he truly wants to get back into the black and white striped suit. Even I can admit that the idea of Keaton playing Betelgeuse again is enticing but it is a false hope. The chances that this team can bring back to life the magic Beetlejuice maintains to this day are very low. Like basement level low, no scratch that, like Earth's inner core level low. Think about it, Tim Burton's track record of late is nothing to boast about unless you are looking solely at overall branding and revenue he's made for Disney, WB, and himself. And I'm sorry but Seth Grahame-Smith has no track record to get genuinely excited about either. His novel Abraham Lincoln Vampire Hunter was mildly enjoyable for what it is, but to live up to twenty plus years of enjoyment is some ginormous boots to fill. I mean Beetlejuice is in the conversation when you talk about Burton's best work and there is no reason to try rekindling that fire. It is only going to end up a disappointment for all of us (well except for the pocketbooks of Warner Brothers executives). One final reason why "Beetlejuice 2" should not happen, the last time Tim Burton continued to tool around in the underworld, we got an animated series. While I hope this potential sequel wouldn't be as awful as the Beetlejuice animated series, I don't expect it to be much better. On the bright side Seth Grahame-Smith revealed that this project is still very early on, with numerous other projects ahead of it, so it has plenty of chances to derail and or fall apart.